We wanted to go for a walk today, but Nicholas wanted to ride his bike instead. I'm not going to ride until it is at least 60 degree Fahrenheit. If Nicholas wants to brave the cold weather, I won't stand in his way. We walked while he biked. He was pretty good not to race too far ahead of Cathy and me. 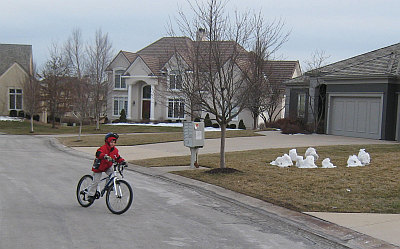 At the end of the bike ride, I snapped a few pictures as he circled around on our driveway and cul-de-sac. On the left you can see the remnants of the snow fort. The snowballs have melted into rather strange shapes, sort of a modern Snowhenge. Here's another picture showing Snowhenge and Nicholas. 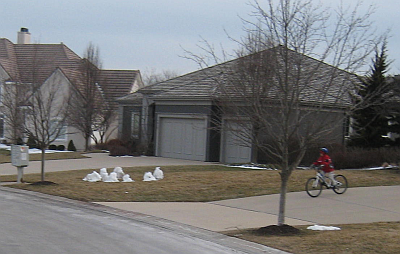 Looking at this picture, it looks like we didn't do a good job with fitting his bike helmet on over his winter cap.